Welcome to the 4th Annual DWSUWF coverage of the Presidential Address to Congress aka State of the Union - The Musical! 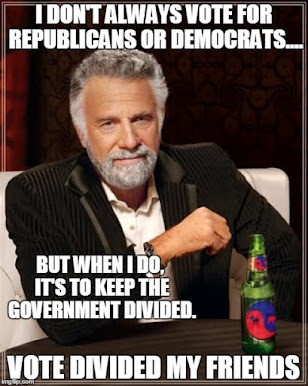 In 2007, as a blogging infant, DWSUWF despaired at finding a unique angle to add to the SOTU commentary when so many other bloggers would be walking the same ground. The answer came from Bob Woodward. I asked Bob (and yes I do feel we are on a first name basis) in an on-line Washington Post forum whether the SOTU had any real relevance. He responded by saying it was "mostly theater." Genius. That was the answer. What better way to frame the SOTU, media and blog reactions than within the lyrics of a Broadway show tune? In 2007 it was "Comedy Tonight" from A Funny Thing Happened on the Way to the Forum. In 2008 it was the 1966 hit "Georgy Girl Boy". Last year, we welcomed President Obama with "Razzle Dazzle" from the musical Chicago. This year a classic - The Wizard of Oz. Particularly apropos, as one year into his presidency many are beginning to wonder about that man behind the curtain. The game is to find blog posts, news stories and commentary that can be vaguely referenced by the lines of the song and link them to the lyrics. I'll post the lyrics now, and then update with links to live-bloggers, references, analysis and reviews before, during and after the speech. It'll be over when I get tired of it or too drunk to type. Yes, I am easily amused. I'll kick this edition off pre-speech by invoking relevant and resonant dialog in the scene where Dorothy discovers the wizard is not all she hoped. Wizard: Oh, you waterboarded him, eh? Very resourceful. ... BUT NOT SO FAST! I'll have to give the matter a little thought. Go away and come back tomorrow." Wizard:"Tomorrow? 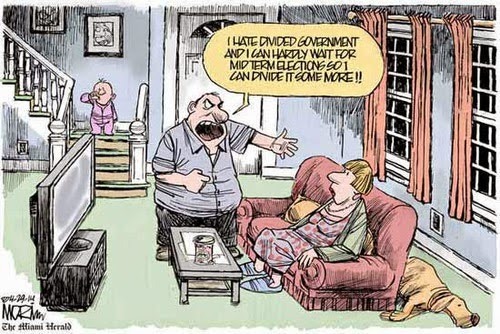 Oh, but I want healthcare now!" Demothy: "If you were really great and powerful, you'd keep your promises." Wizard: The Great Ob has spoken. 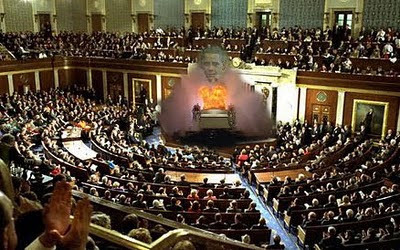 Pay no attention to that man behind the filibuster ....the...Great...er...Ob has spoken. The Wizard: I, I, I am the Great and Powerful Wizard of Ob. Demothy: I don't believe you. Demothy: Oh, you're a very bad man! 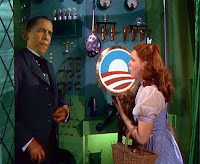 The Wizard: Oh, no, my dear, I...I'm a very good man - I'm just a very bad President. DWSUWF welcomes any and all suggested links, for any and all lines anywhere in the lyric (or dialog), from any who accidentally stumble across this post, at any time. If ever a Wiz! there was. We're off to see the the Wizard.